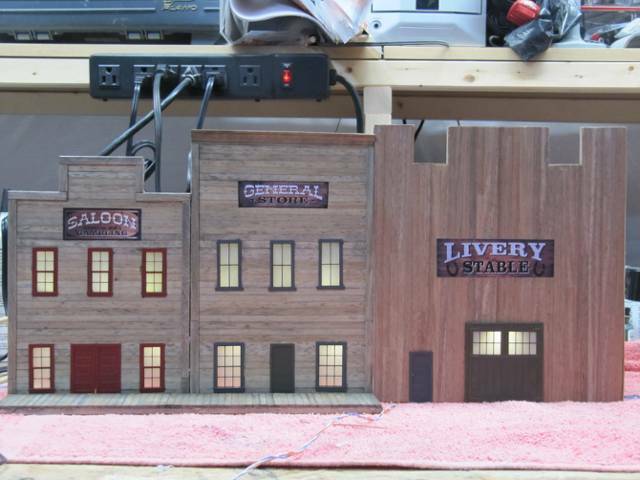 As part of the amusement park I am building, I wanted a wild west town portion. While not really a replica, this area is inspired by my childhood in upstate NY and going to Storytown USA in Lake George. 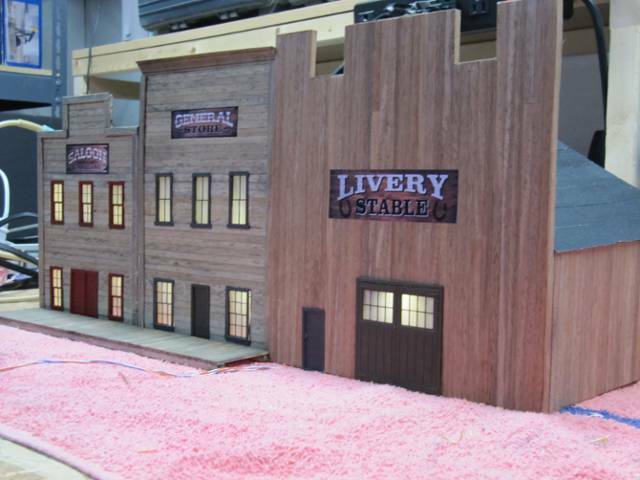 This part will be called Ghost town, and have a train to ride, and a shootout with the sheriff. I went to look for some buildings, but could not really find any that fit my space, so I scratch built these. Here are some shots. 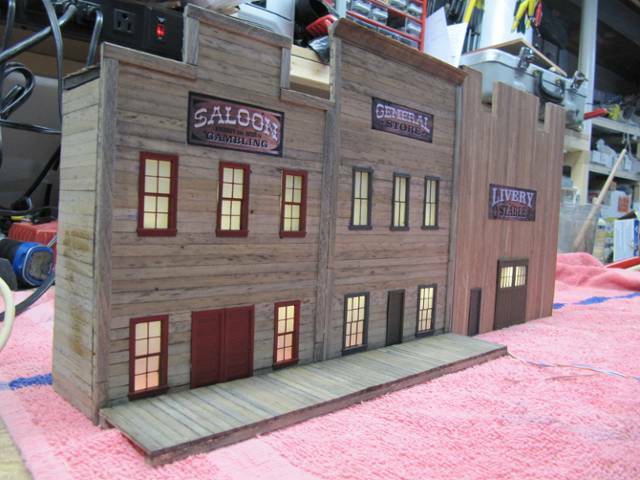 These are foam core covered with real wood, windows from grant line I think, and the roofing is a fine sand paper cut to strips like rolled roofing would be. The signs on the building come from a web site that actually make replica signs, I printed on matt photo paper and attached to the front of the building. 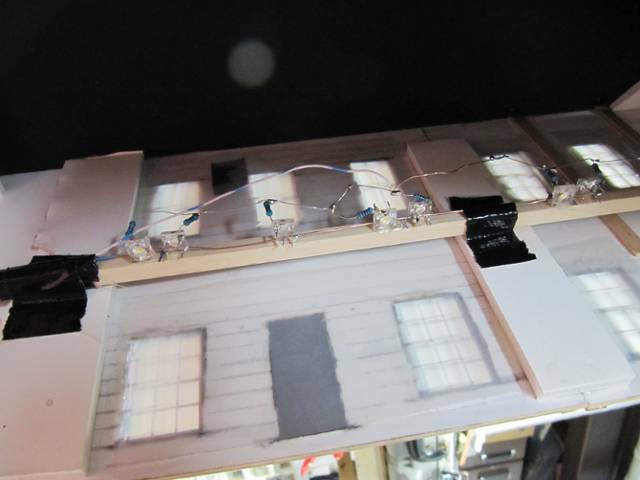 In side I used LED?s for lighting, these are the ones Dale pointed out (Warm White), I used hot glue to attach then to a short piece of strip wood and wired it up with the dropping resistors. Still more to do for that area on the layout, but all in all I am pretty happy with the outcome, I have built kits, and kit bashed some things, but this is my first scratch built structure. Feedback and suggestions are always welcome. Nice Rich - do you have any pics of the roof? There's a lot of neat things you could do with this scene, including perhaps mimicking some memorable parts of old western stories or even movies. OK Corral, etc. comes to mind. Looking forward to seeing where you go with this.